As a developer, there is always the need of finding the best tools for development purposes. It can be text editors, a library to manage tasks, a framework to build your next project, etc. The tools simplify the work environment and improve productivity at the same time. 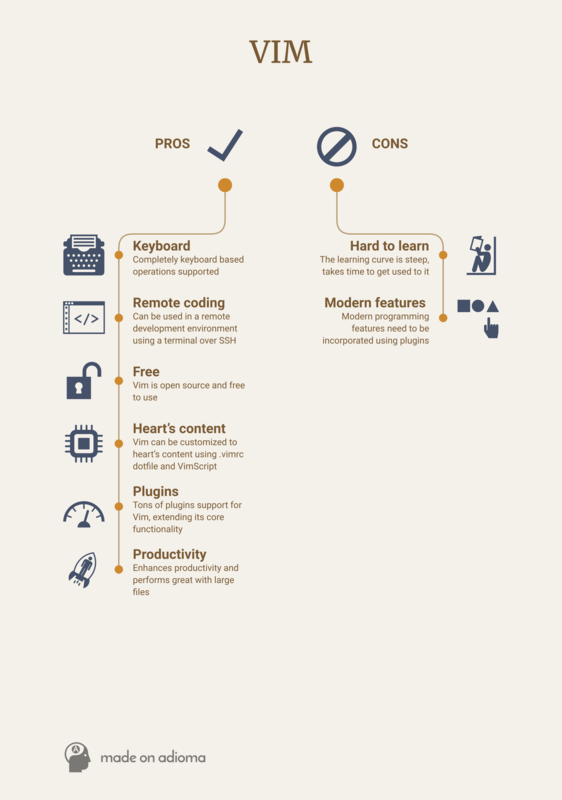 Among all the tools ever used by any developer, choosing the text editor is the hardest one. 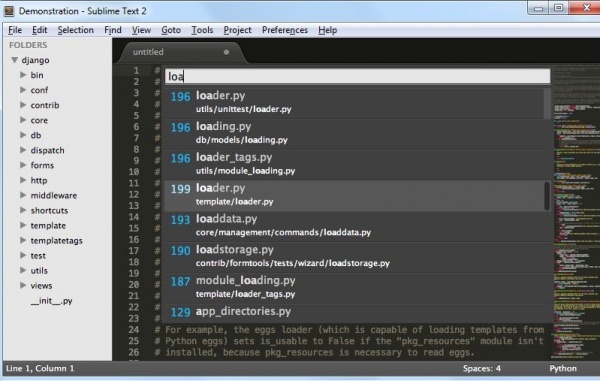 LiveEdu.tv broadcasters use a variety of text editors during live coding sessions and also advocate their personal choice to their viewers. Not to mention that there is a divided community for each popular text editor. It’s like defending what you use and be proud of your choice at the same time. LiveEdu.tv platform has seen quite a bit of it in the recent broadcasts. After all, everyone has their preference and likes to defend it. You can also witness the diversity in choice by watching the premium projects on LiveEdu. 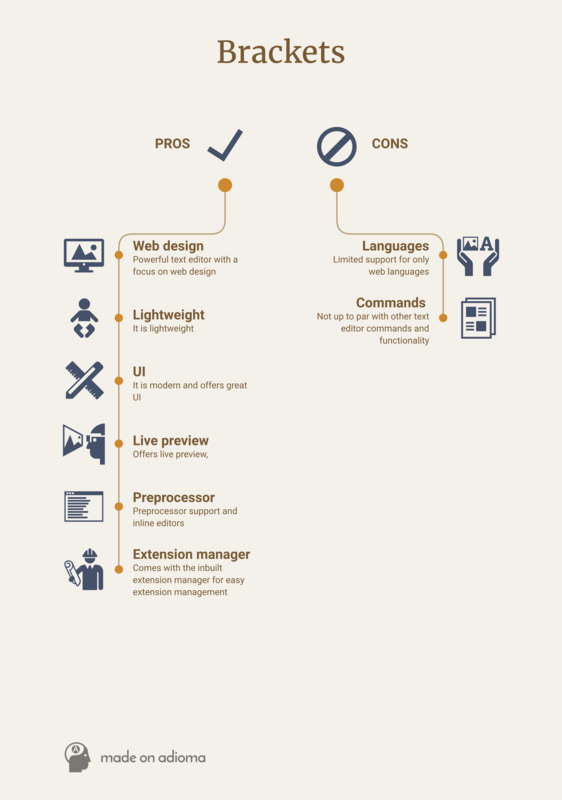 Many streamers have their preference when it comes to choosing a text editor or an IDE. RedIronLabs, for example, used Unity editor for developing Flappy Bird using C#. Text editor plays the primary role in any developer workspace. The project code is written, debugged and executed with the help of the text editor. It’s like a garage to build tools/products for the world. Now, comes the real problem. Choosing the perfect text editor for your work can be a challenging task. It requires skillful experimentation, personal preference, and final judgment. Before you jump into a single text editor; we want you to go through the best text editors for 2016, and learn what they have to offer regarding functionality and usability. We will only discuss six text editors in detail. Other text editors will be linked at the bottom for quick access. Without much ado, let’s get started with the list of the best text editors for 2016. Sublime Text editor is one best text editor in the market. It is a proprietary software with a focus on features. Not only it is a great alternative to a powerful IDE, but it is also lightweight and does the job with great efficiency and accuracy. With tons of features to fiddle with, you will feel the power in your fingertip. But, just like any tool, nothing is perfect. 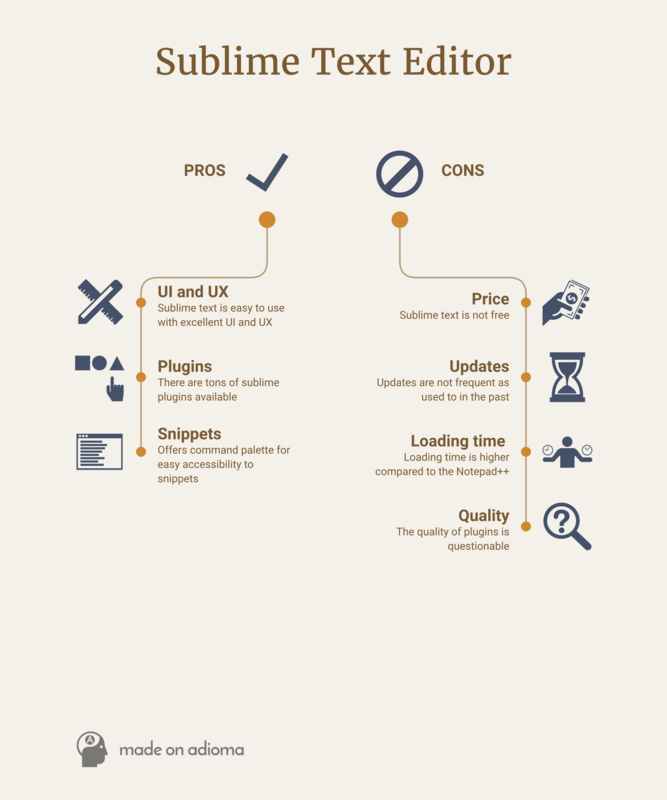 Let’s go through the pros and cons of using the Sublime text editor. 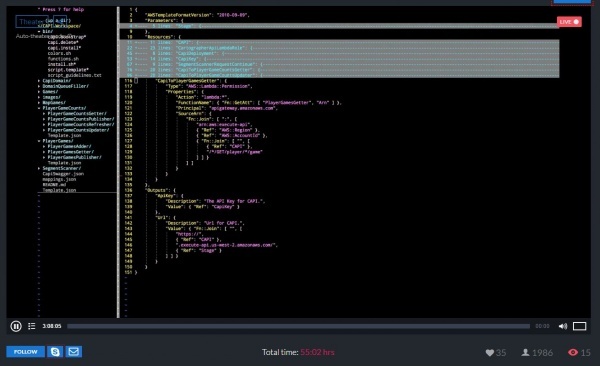 Sublime text is easy to use with excellent UI and UX. There are tons of sublime plugins available. The functionality can be improved easily, and customization is just one plugin installation away. Offers command palette for easy accessibility to snippets, settings and more. Offers multi-line editing and selection. Sublime text is not free. Considering that equally capable free text editors are available in the market, anyone can opt for the alternative. Updates are not frequent as used to in the past. 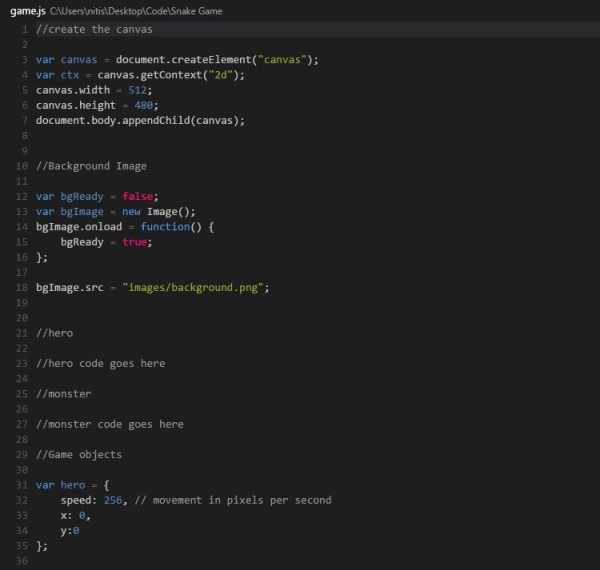 Loading time is higher compared to the Notepad++. The quality of plugins is questionable. Overall, Sublime text is an excellent text editor to work with. You can opt to use Sublime text for free by using the unending trial version. If you don’t like the idea of popups, you can purchase the editor for just $70 (one-time purchase). It works on all the three major OS — Windows, Linux, and Mac OSX. Vim stands for the “Vi Improved”. Vim has survived the test of time and is one of the oldest text editors in the history of computers. Vim is extremely popular among developers and other computer enthusiasts who seek an entirely customizable text editor. Vim is famous for two reasons. First, it supports complete keyboard operations without any need for the mouse. Second, it is present in almost every Unix-based machines. So, portability and ubiquity is a key feature of Vim. Completely keyboard based operations supported. Can be used in a remote development environment using a terminal over SSH. Vim is open source and free to use. Vim can be customized to heart’s content using .vimrc dotfile and VimScript. Tons of plugins support for Vim, extending its core functionality. Enhances productivity and performs great with large files. The learning curve is steep. Takes time to get used to it. Most of the modern programming features need to be incorporated using plugins. Atom is advertised as the hackable text editor for the 21st century. Atom was introduced a year ago with a focus on providing a hackable text editor. It resembles Sublime text and succeeds in providing similar experiences to Sublime. Just like any gem, it is also plagued with issues. The UI and UX are excellent and perfect for a great coding session. Other key features include the ability of auto-completion, file system browser, multiple panes and much more. Atom is open source and free to use. Tons of packages to use. Hence, highly customizable. Uses CoffeeScript to write packages. Hackable to the core, thanks to the modular design used by the text editor. 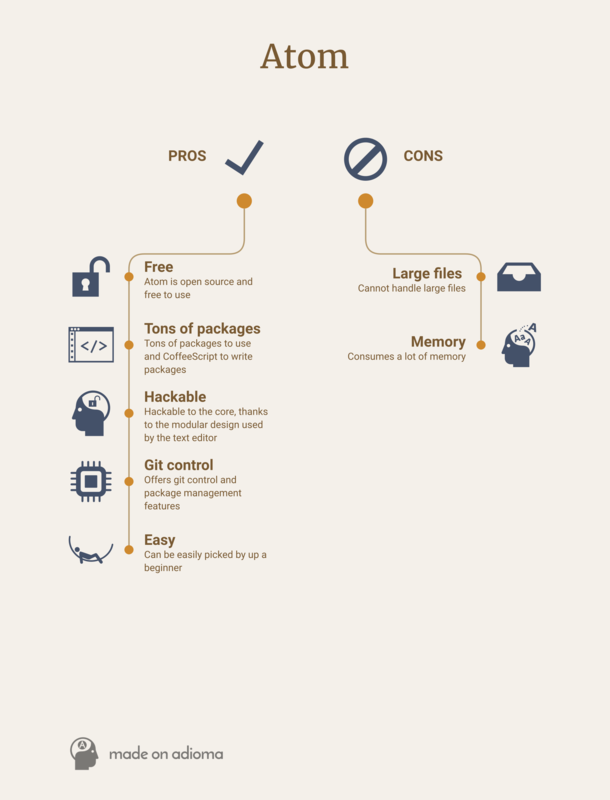 Offers git control and package management features. Can be easily picked by up a beginner. Cannot handle large files and tends to crash if you load files above 10 MB in size. Consumes a lot of memory. If you are looking for a free, open source text editor, Atom is an excellent choice. But, it is advisable to ignore Atom if you plan to work on large projects. It is available for all the three major OS and is completely portable. Visual Studio Code is an effort by Microsoft to enable developers to code without downloading the massive Visual Studio editions (3 GB+ size). Visual Studio is a lightweight, open-source text editor, aimed to provide seamless development experience on all the major platforms — Windows, OS X, and Linux. Key features of Visual Studio code include 30+ language support, code-focused editing, auto-complete, code navigation, etc. It also offers Git version control and debugging tools for easy development. Supports 30+ languages and also Microsoft’s core languages such as ASP.NET, C#, etc. The small size ensures that quick installation and usage. Updating on Linux can be a daunting task. 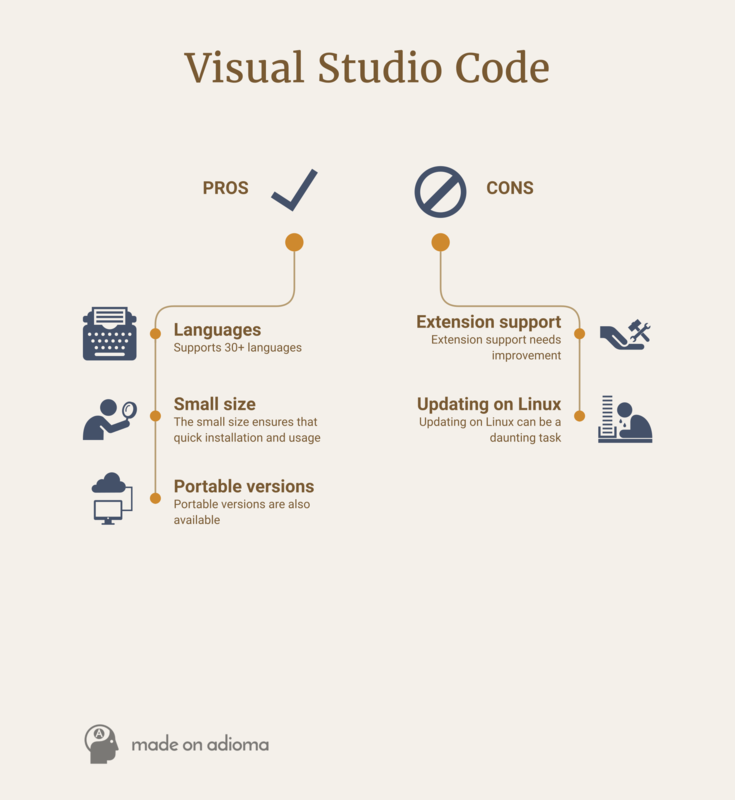 Visual Studio Code is an excellent choice for developers who are not eager to download a huge clunky IDE for their development purposes. It is small, sweet and does the job! 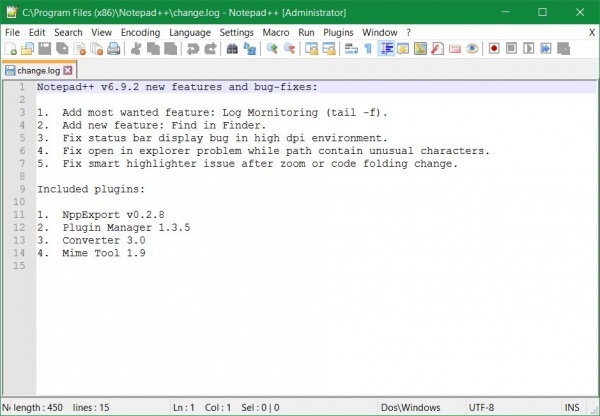 Notepad++ is yet another open source text editor in the market. 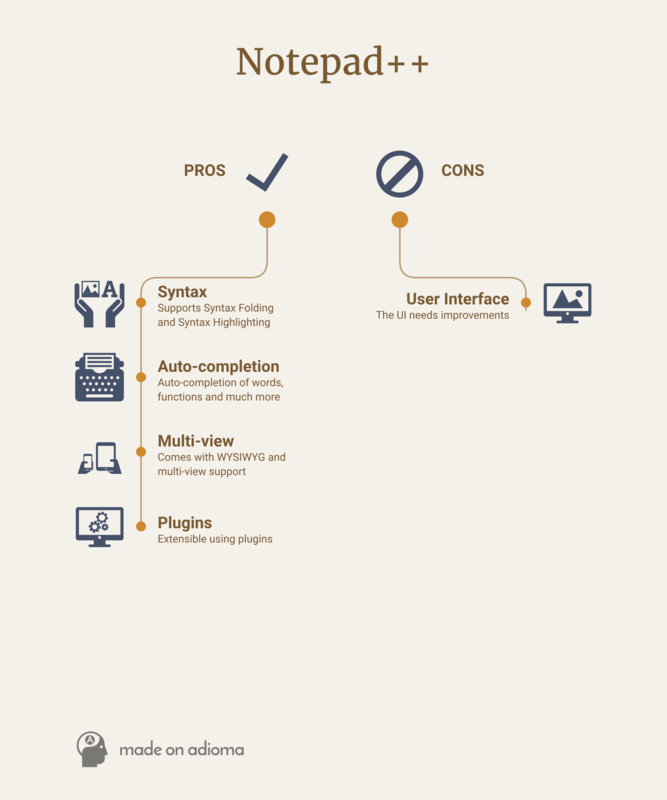 It resembles the vanilla notepad and improves it in every possible way for text editor purposes. Tons of programming languages are supported out of the box. The biggest advantage of Notepad++ over any other text editor listed here is the fact that it can manage huge files without any major lags or crashes. It is very fast and lightweight. Moreover, its functionality can be extended using hundreds of available plugins. Supports Syntax Folding and Syntax Highlighting. Auto-completion of words, functions and much more. Comes with WYSIWYG and multi-view support. The UI is not the best out there. Needs improvements to meet current industry standards. The text editor can benefit from the addition of new language support. Too simplistic. New features are always welcome. Notepad++ is for those who want simplistic UI and feature set. It is clean, fast and an excellent way to do the new stuff! Our last text editor that we will discuss in detail is “Brackets.” With open source tag, Brackets can be used by anyone. Brackets is not a universal text editor, but a text editor that focuses on front-end development, i.e. web design purposes. Support for front-end language is extensive, and that’s why you should only consider Brackets for front-end development. Brackets is a powerful text editor with a focus on web design. It is lightweight, modern and offers great UI. Offers live preview, preprocessor support, and inline editors. Comes with the inbuilt extension manager for easy extension management. Limited support for only web languages. Not up to par with other text editor commands and functionality. With so many text editors out there, it is not practically possible to discuss every one of them. That’s why we list the least known, but amazing text editor of 2016. Do, check them out! A text editor is an indispensable tool in any developer’s arsenal. With major text editor discussed, we hope that you can now make the final call. If you think that we have missed a text editor that should have been mentioned in the article, don’t forget to comment below and let us know. We will update the article accordingly! Loved the article? Share it now with your social media friends!